Carlos Carmona Fontaine, in between finishing his paper and starting his lab at NYU, found time to make the official 2016 Xavier Lab MUG. Colored in the beautiful parula map, the 2016 mug is the best mug in the world for coffee or tea. Check out Carlos’s lab website carmofon.org. Join his new lab at NYU Biology and you might make it in time for the first-ever Carmona Fontaine Official Mug. Read more about the 2016 lab mug and our other mugs in our paraphernalia page. On Tuesday, November 10, MSK hosted the tenth annual “Major Trends in Modern Cancer Research” lecture for high school and college students. The session was moderated by Craig Thompsons and featured Kat Hadjantonakis, Cole Hanes and me. The whole session is on youtube. During my PhD, 1999-2003, most scientific articles I needed for my research where only available in print. I’d go down to the library and take hours photocopying articles from piles of journals. I also listened to a lot of CDs and I loved the cover art. I haven’t picked up a CD in a while and I’m pretty sure new CDs are still made, but I don’t know who buys them. The art from new covers goes unnoticed – I haven’t seen one from the last 5 years or more. Journals still get printed too, but like songs we get the articles online. Grad students don’t spend hours copying in the library, which is great. But some nice covers will go unnoticed. 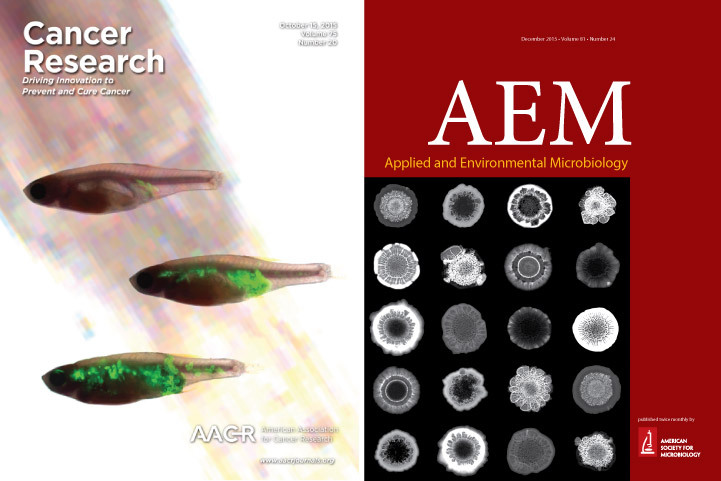 Covers from the October 15 issue of Cancer Research (collaboration with Richard White’s lab) and the December 2015 issue of Applied and Environmental Microbiology (collaboration with Lars Dietrich’s lab and Soren Sorensen’s lab). Metastasis, the spread of cancer from its primary site to other parts of the body, is when cancer gets really bad. But this process is poorly understood, in large part because it is stochastic. Like the dispersal of plant seeds across a fertile field, metastatic cells could end up in many different places so knowing where metastases will form exactly may seem impossible. What we need to study physical phenomena that are stochastic is lots of samples and statistics. Studying metastasis across large samples can be very difficult however. Investigating patterns of metastasis in the human body would require compiling dozens of cases while controlling for factors that could influence metastasis in unknown ways like patient age, body-mass-index, exposure to carcinogens, etc. We could use animal models and control for these factors, but common models in cancer research like mice and rats are still quite expensive to run experiments with dozens of samples. Enter the glorious zebrafish. The zebrafish is already a powerful model for genetics and development and it is gaining increasing importance in cancer biology. Our lab collaborates with the lab of Richard White in the program for Cancer Biology and Genetics to investigate metastatic spread across dozens of zebrafish. For the past three years Silja Heilmann has been working closely with Rich, Kajan and other members of the While lab to develop protocols and methods for the quantitative analysis of metastasis. The model is a transparent zebrafish called Casper that is great for imaging. In Rich’s lab, they developed a zebrafish melanoma cell line called Zmel1 that expresses GFP. Once injected into adult casper zebrafish, Zmel1 forms primary tumors that later on produce metastasis and we can visualize the process using microscopy. Silja developed image analysis algorithms that resize and align many pictures of fish together. This procedure allows building a statistical picture of metastatic growth across the whole animal. The detailed picture reveals indeed the strong stochastic nature of metastatic spread, but some patterns start to emerge. Advancements such as these may one day enable a better understanding of metastasis and help in the development of anti-metastasis treatments. Organisms of different species have different shapes and sizes and still, within the same species, shape and size are practically constant. 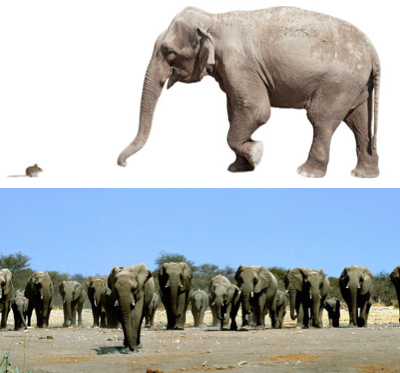 For example, elephants can be 250,000 larger in volume than mice, yet when we compare elephants of the same species and controlling for age they shouldn’t differ by more than 2x (I’m is guessing – I couldn’t find any reference for this). How do organisms within a species maintain relatively constant shapes and sizes when it’s at least physically possible to have wide variations? This seems a question for developmental biologists, but microbial cell biologists are very interested in their version of the same problem. Bacterial species can vary enormously in cell shape and size. One of the largest, Thiomargarita namibiensis (100–300 µm), can be 1000x longer than one of the smallest known Mycoplasma genitalium (~300 nm). Nonetheless, within a species, their sizes are often constant and, we imply, very well regulated. There was a recent burst of papers where different groups across the US measured with unprecedented precision the distribution of cell lengths in the rod shaped bacteria E. coli, Calaubacter crescentus and Bacilus subtilis. From this collective work a simple mechanism seems to emerge: Rod shaped bacteria decide when to divide by determing that they added a fixed increment to their cell length. This so called “incremental rule” (a.k.a. “adder model” or “constant size extension“) had been proposed earlier but lacked empirical support. It provides a simple explanation for why cell populations maintain a narrow size distribution – I strongly reccomend reading those papers. We added additional evidence for the incremental model by showing that the pathogen Pseudomonas aeruginosa, our model organism, also follows the incremental rule. Our interest in this problem came by accident when we isolated a mutant with abnormally long cell from our hyperswarming experiment. In our new paper we analyze the length distribution in wild-type Pseudomonas aeruginosa and in this mutant which we call frik, not only because it is a freak but also because it reminds us of the tasty dutch snack frinkandel. frik cell on the left and the dutch frikandel on the right: A striking resemblance. The frikandel is a meat based rod of mysterious composition. It’s probably made with left over meat, but it’s hard to tell exactly what its composition is from it’s spicy taste and spongy texture (hmmm…). Similarly, exactly why the frik cell is abnormally shaped is somewhat a mystery to us. We resequenced the genome of the frik mutant and we found two candidate mutations. We were capable of ruling out one of those two using microbial genetics. The second one, however, is really hard to clone and we could not confirm nor refute that it is the cause of the frik phenotype. One explanation is that the mutation is in a gene (PA14_65570) that may be essential which would make it harder to clone. Still, our paper extends the reach of the elegant incremental model by showing that it also applies to P. aeruginosa, a common cause of opportunistic infections. We also show that the frik cells are more sensitive to some antibiotics, suggesting that affecting cell size regulation could have implications for improved antimicrobial therapy.